I decided to get out "This is the Day" yesterday. I worked on the over one portion all night. What a pain! Over one on 40 ct. is not too fun, but I'm happy with how it turned out. I ended up putting Nicole N instead of my initials. I started on the bottom portion today. I used Red Currant for the vase and Wild Berries and WDW Red Pear (thanks for the idea Katrina) for the flowers. I also used Wild Berries for the words and Red Pear for the heart. GORGEOUS!! I just love it. This is stunning. Love the new blog look too. It's really coming along Nicole!! I have a question about American Frame. When you order, do you give them the exact size of the stitched piece and they account for a margin around the outside, or do you calculate the margin into the size you give them? WOw you've really made some awesome progress on this one. Love the colors. 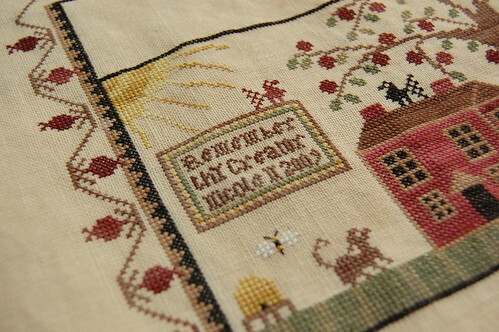 Such a beautiful sampler, Nicole. And congrats on finishing Ida Mae. Your needles are certainly flying! 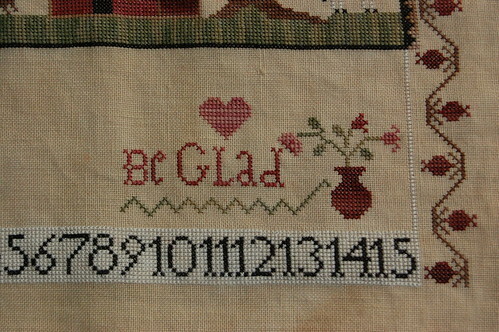 It's a beautiful sampler and you're progress is moving right along. May have to make note of your colors too. I want to start this really soon. This is the Day looks lovely. You will have it finished in no time! Absolutely gorgeous!!! Nicole, it seems everything you stitch I end up wanting....lol!! I LOVE THIS!! Nice over one! I love the colors on the box around it! That is just beautiful. I love the colours you are using! Wow, that is just fabulous! You do such gorgeous stitching. Beautiful! This piece is magnificent, you are certainly doing and excellent job. I'm loving watching this piece unfold. Wow, it is looking so great, Nicole!! I like your addition of the Red Pear, it is a fave color of mine! It won't be long now, till this is finished, I am sure! 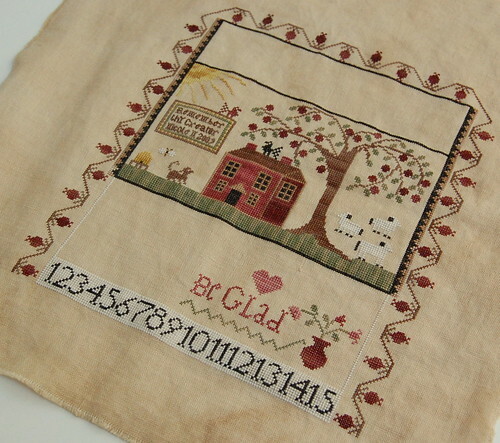 How lovely this sampler is! i wish i could find the magazine in france! "This is the Day" is lovely, Nicole - I can't believe you stitched that section over one on the 40ct! It's amazing! Nicole, I just love the colors that you've chosen for this! It is coming along so nicely. What a beautiful pattern, such vibrant colours ! You are so right to have decided to stitch it - it must be so pleasant.